New York City is typically defined by the verticality of skyscrapers and the rigidity of the urban grid. This exhibition reimagines the five boroughs in terms of the organic flow of microbes and the indiscriminate spread of disease. A collaboration among the Museum of the City of New York, the New York Academy of Medicine, and the Wellcome Collection, the exhibition features over 100 scientific and historical artifacts, commissioned artwork, and a reading room designed for reflection and audience engagement. Spanning 4,400 sq. ft., Germ City is the first segment of a multi-city initiative to “highlight the social and scientific interplay between people and pathogens” in the urban environment. Polio Care Open to All, Milton Ackoff, The Museum of Modern Art. Anonymous gift, 1979. 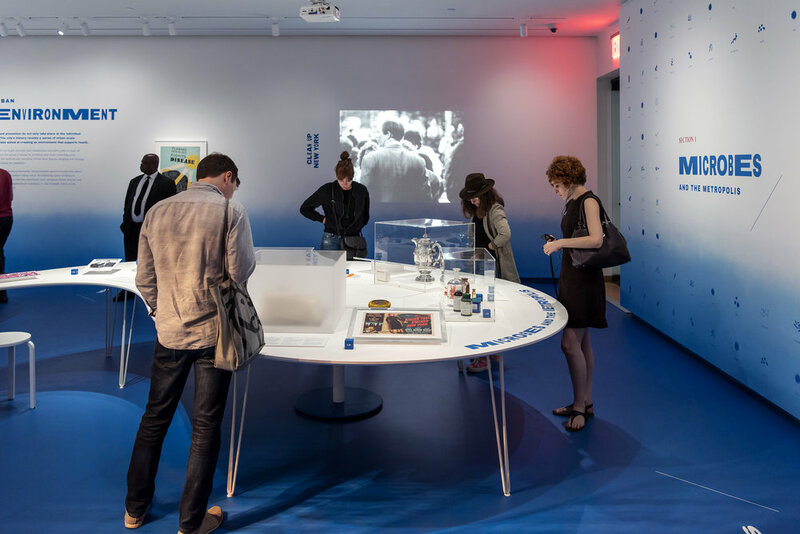 Organized thematically rather than chronologically or by disease, the main gallery features a single, curvilinear table that carries most of the exhibition objects, symbolizing the movement of contagion through the city. The lobes of the table each correspond to a single theme and metaphorically represent New York City's five boroughs. The gallery walls are painted with a miasmic gradient that rises from a blue floor, evincing the diffusion of microbes in space. 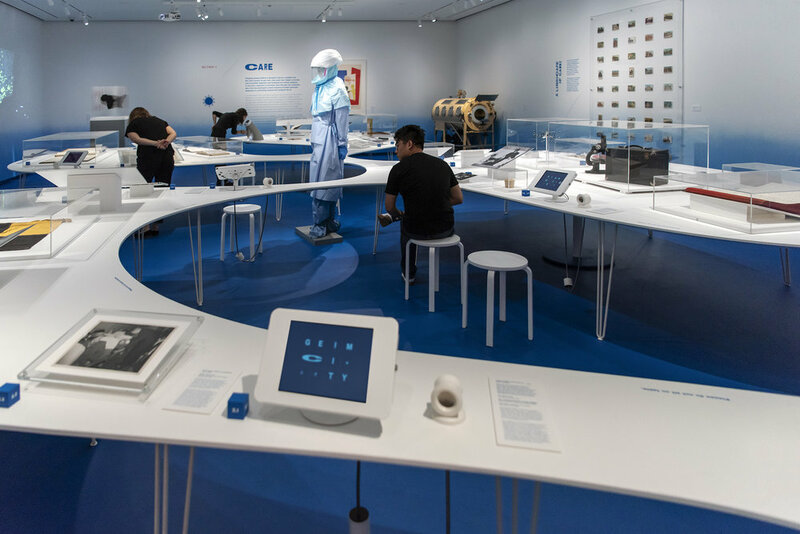 Drawing on the model of the Wellcome Collection’s “Reading Room,” Germ City also features a hybrid gallery and library where visitors can react to the exhibition and deepen the museum experience through physical and digital interactive displays. We designed four smaller microbe tables for this gallery, creating a space for visitor engagement.